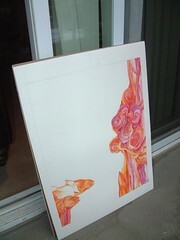 i have begun what will be my largest watercolor to date -- 16x20". i can see it is going to take quite a while! i am going to stick with this color scheme. you can see some coelacanths on the left. (coelacanths are primitive bony fish which were thought to have been extinct for tens of thousands of years until one was caught off the coast of south africa in 1938. they are sometimes called "living fossils". the name is pronounced see-luh-canth. there are more photos on flickr. click this photo to go to my photostream. another photo taken by audin. 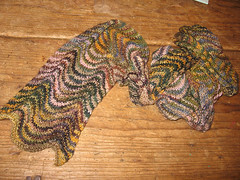 this is the chevron scarf from last minute knitted gifts. the yarn is koigu in 4 shades. thanks go to audin for taking this picture. and lending me his living room as the backdrop. 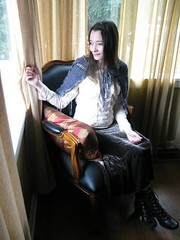 this is scala, the louisa harding shawl i finished recently. there are more photos on flickr. april knitting project - taos shawl! 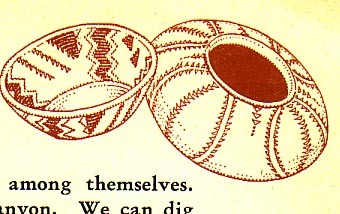 i am hoping to get 2 knitting projects done in april, though we will see. this is project one. 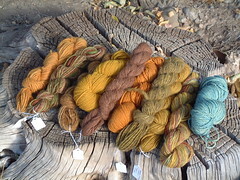 i bought all these wonderful hand dyed (and some handspun) yarns at la lana wools in taos. my family and i were there in october. these beautiful colors represent the colors of the autumn landscape in new mexico. so i am making a shawl to remember the trip by. i cast on last night! i managed to get the march beaded journal house done in 1 weekend. good thing because i put it off till the end..
when i was a child on vashon island, there was a clearing near my house where a house had once stood. it was over run with bluebells this time of year. happy spring. though it did not feel very spring like in seattle. 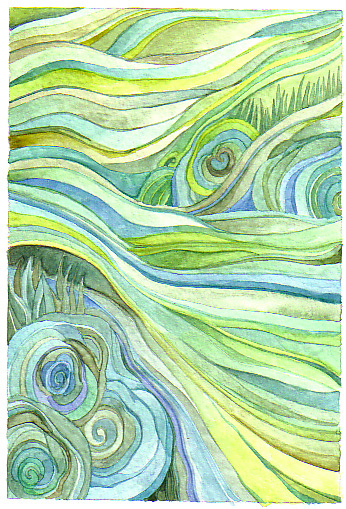 i painted this a week or two ago..
and here are some scans from another children's book. 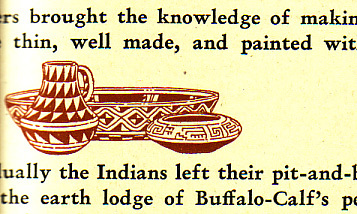 these are from another book written and illustrated by holling c. holling called The Book of Indians -- which is, i think, as politically correct as any book published in 1935. i do quite like the pen and ink illustrations, which are reproduced in sepia tones. that is the reason i bought the book. 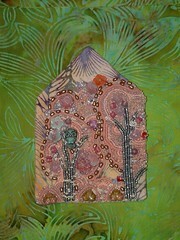 well, it's only mid march -- high time i finished my February Beaded Journal House. it's not that i am such a slow beader-- quite the contrary -- but i do have my knitting, my painting and drawing, and my reading to keep up with. not to mention full-time employment. i have, fortunately, cut way back on my chores by hiring some out. i must say i wish i had done that long ago. fortunately i found an economical arrangement and it leaves me more time for art. and the time i do spend on chores can be spent doing things like sorting and organzing rather than scrubbing, the end result being my condo is approaching organized! and tidy! and less STUFF EVERYWHERE. 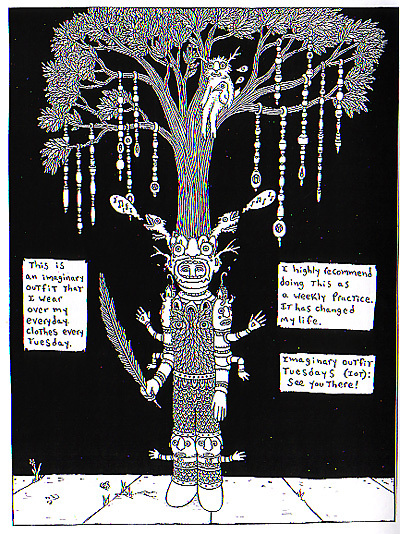 (you know, of course, that i live in 515 square feet, which is a bit tight for doing art in PLUS living. you can see some photos and a floor-plan here. so anyway, this is the february house. 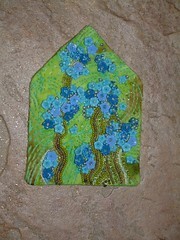 And I made the form and pulled together some beads for the March house. 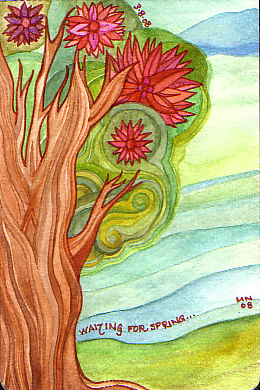 Both of which are beaded around my longing for, and celebration of: SPRING. the most hopeful time of year! and after another grey NW winter, a balm indeed. i am so thrilled that we finished going through the library of books we were going through at work today. 2,140 books, 108 boxes, and i estimate about 2 tons of books. last summer and fall i went through an additional 2700 books, documenting them and packing them up. fascinating collection but so gosh darn HEAVY. Theo is an art genius overlord. 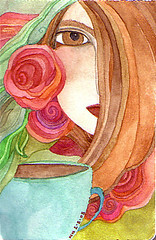 and, as an after thought, my 2 latest paintings.. they are each 6.5 x 4.5" and watercolor. my back is feeling a little better. i even managed to work on a painting some last night, while propped up against my headboard, reclining on an ice pack. 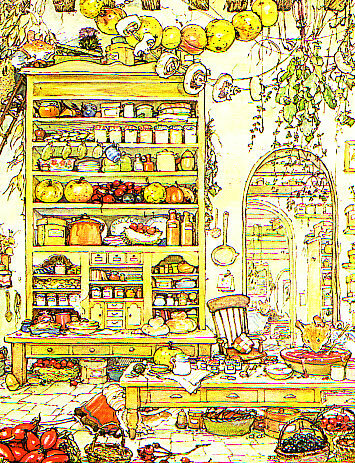 today i have to share with you 2 illustrations from Autumn Story by Jill Barklem, part of the Brambly Hedge series. 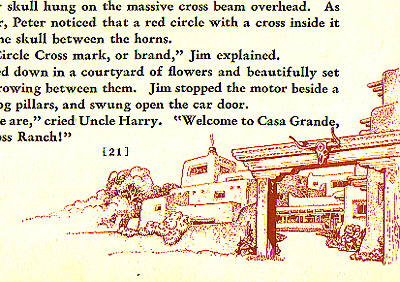 gosh, i sure wish i could be a kid's book illustrator. my hurt back is slowing my art way down. 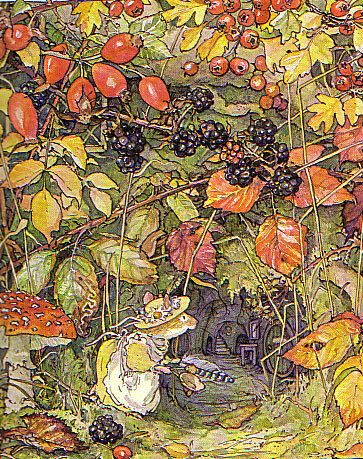 and art is what i usually post...so i thought i would post some visual stimulation for the next few days .. meaning i would post some scans from my collection of children's literature. 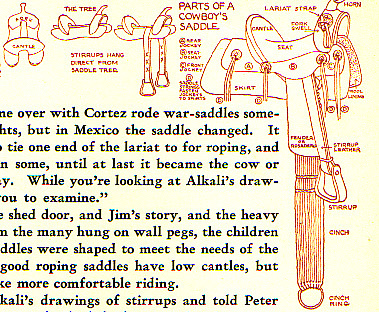 today's scans are both from The Book of Cowboys written and illustrated by Holling C. Holling. it was published in 1936. a small child has written a bit in my copy. i wonder if donnie griffen is still alive. he says his phone number is 33302.
hopefully i will scan some more from another book tomorrow! the last few days i have been laid up with a hurt back. actually, for the last week.. but the last few days have been the worst. i injured my back last year and the re-injury rate is something like 80%. i've been cataloging hundreds of books at work and they do get heavy. so, well. i have been lying about and not doing much. reading a bit, etc. 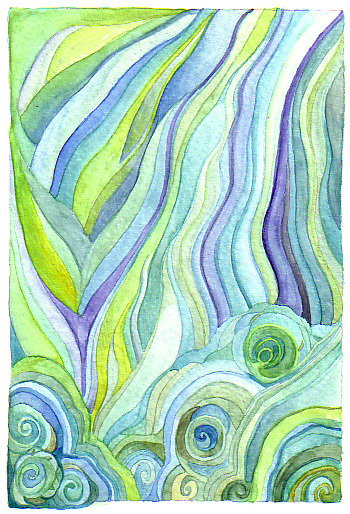 i did break in my new watercolor moleskine journal with this little painting... i hope to do better this coming week, by being careful, getting extra sleep, and doing the PT exercises i was given last year. 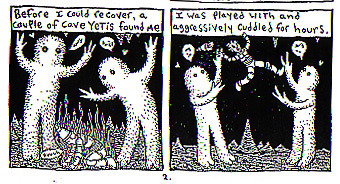 you might have seen these on my blog this morning, but those were not very good scans so i am going to delete that entry. these are a bit better.. and you can see them larger if you click the thumbnail to go to my flickr account. 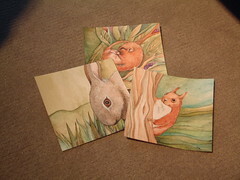 i have also listed these on etsy. 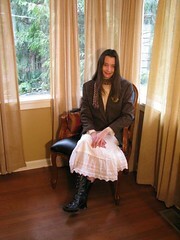 it was a long day and i am tired, so i think i will be going to bed with a book soon. i am reading The Tale of Hill Top Farm (The Cottage Tales of Beatrix Potter) by Susan Wittig Albert. it is charming so far. i am still painting away.. trying to get better at drawing and painting realistic animals, with some hints of my whimsy, but more grounded in reality :) it takes a lot more discipline and patience! i like drawing imaginary things because no one can say, "well, honestly, the last winged mouse i saw looked nothing like that. it had smaller ears and a longer tail." so, anyway i am trying. 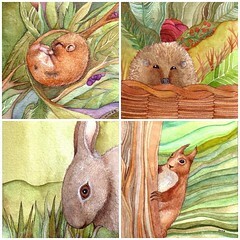 i am currently working on another version of the red squirrel and have no idea if i am going to like it or not. the important thing is to keep painting and keep practicing. click on the photo to see larger!